Sitting around the dinner table a few years ago, my dad and I got into a debate about cultural appropriation. We’d been talking about a news story that had gone viral about a white couple who’d hosted a Bollywood-themed wedding, and in response to the irritation in my voice, my dad told me he thought I was getting riled up about nothing. Despite having witnessed the lingering effects of cultural exploitation in India first hand, my dad, nonetheless, held the opinion that this wedding was a flattering celebration rather than a pernicious hijacking of our culture. We talked in circles for about 30 minutes before we eventually got too tired to debate anymore and we dropped the issue. For better or for worse, this is a reasonably accurate microcosm of how all conversations about appropriation unfold online. Cultural groups are not ideological monoliths, so it’s nearly impossible to form a consensus about what constitutes appropriation in our own communities, let alone within society-at-large. Viewed through the lens of this societal discord, Drake’s sticky reputation as a “culture vulture” is curious. 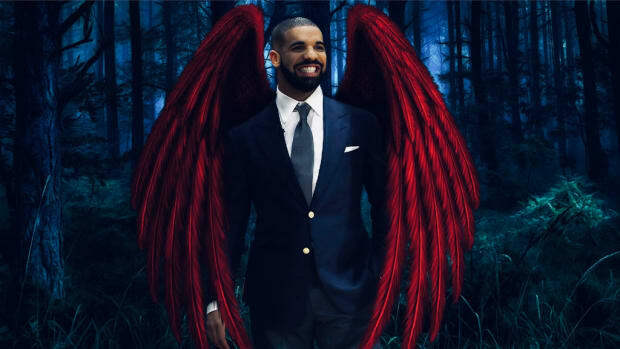 Despite a lack of consensus about what this term even means, the label has affixed itself firmly to Drake for most of his career, rearing its head in reference to his well-documented forays into different genres and collaborations with buzzing artists. Of course, the reason “people have their own outlook” on the issue is that the optics of these collaborations aren’t always in Drake’s favor. Having attained his current status as one of the biggest artists in the world by continuously keeping his finger on the pulse of music’s latest trends, any moves he makes to experiment with new soundscapes and/or collaborate with emerging artists are inevitably going to be seen by some as cynical or predatory. Admittedly, there are specific instances where he’s erred on the wrong side of this line—like the many times he’s emulated a fake Jamaican accent, or when he flipped D.R.A.M.’s “Cha Cha” into “Hotline Bling” without giving him credit—but, just the same, there are other instances where Drake’s detractors are simply reading his intentions in bad faith. It’s worth noting the benefits of Drake’s co-signs, while sometimes disproportionate, are nearly always mutual. Consider the career boosts Future and Migos received when Drake hopped onto the remixes of their songs “Tony Montana” and “Versace.” There’s little doubt Future and Migos would have broken into the mainstream eventually, but to act like Drake’s endorsements didn’t speed this process along would be disingenuous. Were these songs hit records that bolstered Drake’s street cred and kept his name in the conversation? Absolutely. Yet, considering how immensely beneficial his participation was for everyone involved, you’d really have to squint to view his actions as malicious. Where this charge appears to carry more weight, however, is in regard to Drake’s brief involvement with artists like BlocBoy JB, iLoveMakonnen, and Ramriddlz. In these instances, you could conceivably make the argument Drake manipulatively used these artists for personal gain, but if you were to raise this point, it'd only be logical to ask yourself what it was you felt Drake owed these artists in the first place. When you boil it down, Drake essentially committed the crime of giving these artists a signal boost they were unable to capitalize on. It was hardly a Machiavellian act. The odds he engaged in some sort of conniving trickery just to hijack the songs “Look Alive,” “Tuesday,” and “Sweeterman”—all of which will ultimately be forgotten in the grand scheme of his career—seem rather low. His incentives for wanting to co-opt an entire culture’s musical genre, however, are a little more intuitive. You could point to the way he leveraged Afrobeats to make “One Dance,” for example, as an indication Drake sometimes takes more from the genres than he gives back. Simply collaborating with Wizkid—while certainly a good start—doesn’t seem like an adequate repayment to the West African region that pioneered the template for one of the biggest hits of his career. Given he's perpetually experimenting with new genres, it's Drake's responsibility to continuously reckon with the thorny questions about whether he's adequately respecting these genres or harmfully appropriating them. He hasn't always arrived at the right answer, hence the "culture vulture" debates he incites, but it’s worth noting his success rate seems to be trending upward. In the meantime, much of the world has learned more about grime, Afrobeats, New Orleans bounce, Miami jook, and various other genres from Drake than they have any other singular mainstream artist currently releasing music. If the trade-off for this is a few circular conversations, like the one I had with my dad a few years ago, I’d say it’s probably worth it.